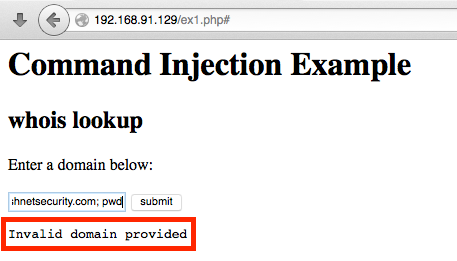 Command injection, like many of other web application vulnerabilities, finds its root cause in the lack of input validation. This vulnerability type should be fresh on everyone’s mind with the recent exposure of the Shellshock vulnerability late last month. One of the more challenging aspects of web application design is taking in user-supplied input and acting upon it in a secure fashion. 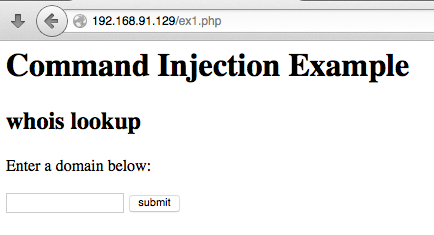 This is where the command injection vulnerability exists. 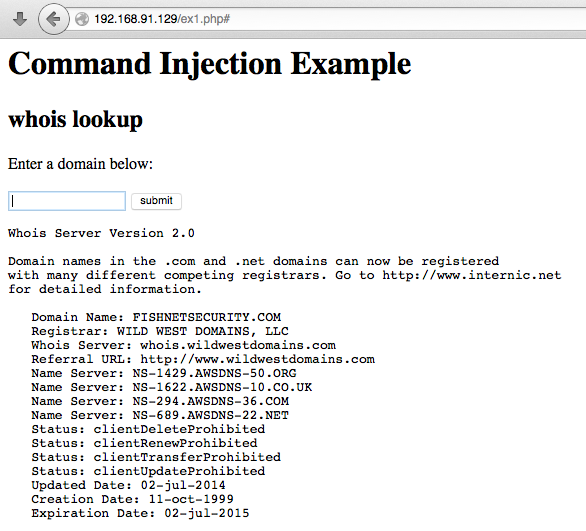 Command injection can occur when an application, say for example, takes in a domain name and performs a whois lookup on the supplied value. When the input from the user is received by the application, a check must occur prior to executing the predetermined command in conjunction with the user-supplied value. The vulnerability arises when that check is not present or stringent enough, and the application command to the underlying operating system is tainted with the malicious input from the user. This creates a condition where the user-supplied value is then executed as a command on the operating system. Let’s take a look at a basic example of this vulnerability in action. Here we have an input field that sends an HTTP POST request to a PHP variable. The variable is then used to perform the OS command whois. This is then accepted by the PHP block of code and assigned to the PHP variable “target” which is passed immediately to the underlying operating system for execution. Note the vulnerable code is based off of the excellent Damn Vulnerable Web Application project (http://www.dvwa.co.uk/). The vulnerability occurs because no user-supplied input validation occurs before passing the $target variable to the $cmd variable for execution. Let’s take a look at the inputs we could provide to gain OS level command execution. As shown in the last screenshot, a command was added to the domain form field and passed to the application with a semicolon (;) between the domain and the command we attempted to execute. This is successful due to Linux-based systems allowing us to submit multiple commands at once when separated by a semicolon. When we submit our domain followed by the injected command and scroll to the end of the whois output, we see that the command successfully executed and outputted the result of the command. In this case, it is the present working directory of the web application (/var/www). The above commands tell the host to perform a whois lookup on fishnetsecurity.com, download the shell text file via wget, place it in /tmp as a PHP file and lastly, list the contents of the /tmp directory to confirm the previous actions. We need a listener on our local host to receive the shell once executed. 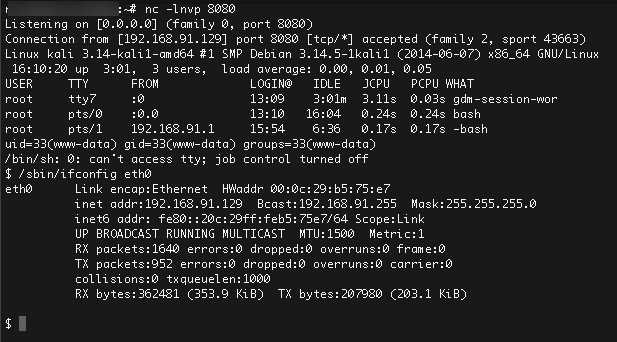 This can be accomplished via a netcat listener configured to listen on the port specified in the PHP code. It should be noted that the permissions or privilege level of the shell are going to depend on the process that is running the web server. In our example, it was the Apache user www-data, which did not have elevated privileges on the host. Also note that many applications are set to run with elevated privileges such as root (Linux) and SYSTEM (Windows). 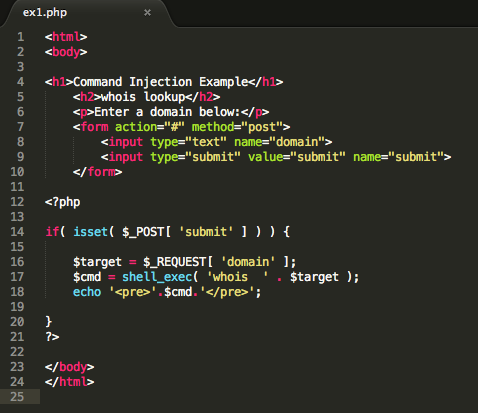 Lastly, this was a single example of command injection and the point in which it can be executed. Injection can occur via multiple points. Other examples could be found via a GET parameter as represented below. The %3B value is the URL encoded representation of a semicolon, which separates the domain to be looked up and the injected command. As mentioned earlier, the root cause of this attack is lack of input validation, so let’s update the PHP code to only accept valid characters as they pertain to domains. Without going into all of the specific standards for domain names, at a high level, they can only contain letters, numbers and dashes (but cannot start with one). 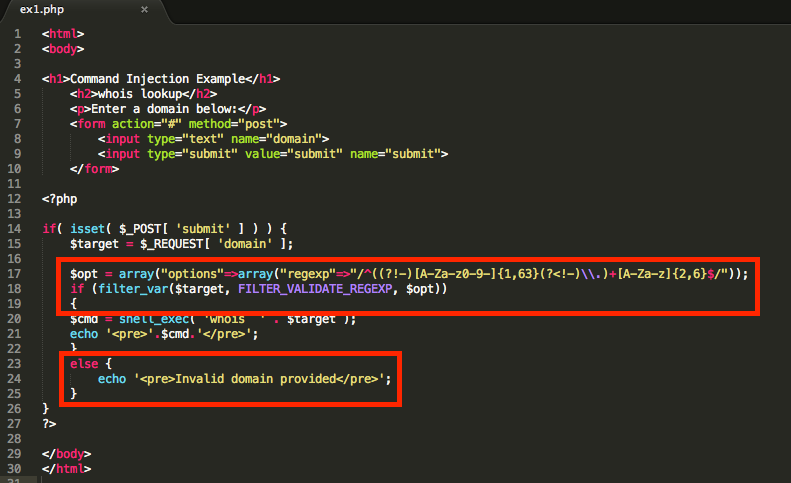 The regex above matches the provided input to ensure a proper domain and mitigate potential malicious input. If the input successfully matches the regex, the code continues to execute the whois command; otherwise it fails to the else condition and the application replies with an invalid input error message. 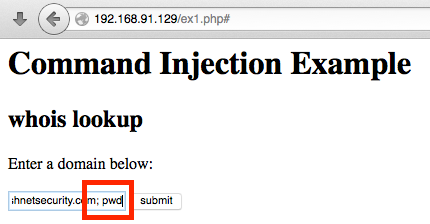 This post was an overview of command injection and how it could be exploited. Again, the primary reason for its existence is the lack of input validation when the application receives user-supplied data. This will be a common theme for web application based vulnerabilities in general and discussed in other posts of this series.